Paul Weller speaks about bringing back Jam classics at his gigs! 03 July 2008 - Paul Weller has been dipping into his back catalogue – as well as playing the odd unexpected cover at his recent shows. At his intimate London gig as part of the iTunes Festival on 2 July, Paul Weller played a spontaneous cover of All You Need Is Love by The Beatles and surprised fans with The Jam’s hit Eton Rifles. Speaking exclusively to 6 Music before the gig, the Modfather explained why he has rarely revisited his former band’s old material. The former Jam front man said that his decision was not for any profound reasons, but because he never thought they would fit into his set lists. Thanks to the band The Rifles prompting Weller to play Eton Riffles before the encore, he is now lining up a few more tracks from his former band’s back catalogue. He revealed that people will be able to make requests about what Jam songs they want to hear during his upcoming shows, but at this stage he would not divulge any more information on that. Weller has had a mammoth year, turning 50 and releasing a double album 22 Dreams in June, which went to number one. 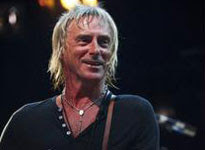 Despite being thrilled with its success, Weller explained that the prospect of reaching number one and making a profit was not the singer’s intention when he set out to make the record. Finally, Weller reflected on the success of his album which he feels has been reflected in his live shows. Telling 6 Music about the positive reactions he has been getting to the new material, Weller said: “It has been great actually. Most songs actually start to take on a different life when you play them live. “It was great because we did the tour before the album came out so obviously people hadn’t heard of most of the songs anyway, so that’s always a challenge. Weller is taking his live show to Europe and after dates in Cork, Milan, Serbia and Spain he'll be back in the UK to play Osborne House on the Isle of Wight on 26 July.